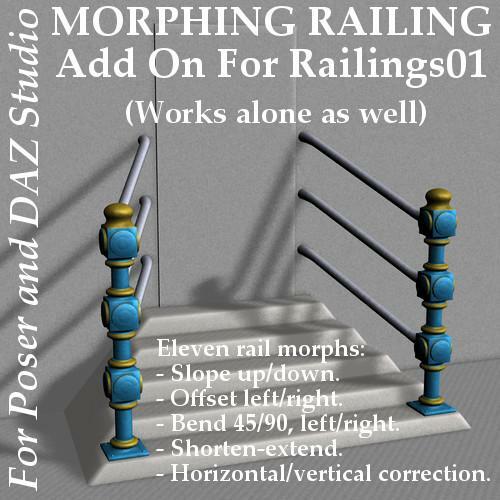 Okay, here's a bit more flexibility for those Railings, an additional 'Morphing Railing'. Lets you bend the rails up, down and sideways and stretch or shorten them. - Shorten-Extend - same as the 'Extend Railings' morph on the original. - Horizontal Correction / Vertical Correction - extra adjustment mainly when Shorten-Extend is used with other morphs (can be used alone as a sharper Slope/Offset). - Slope Up / Slope Down - the start and end of each rail stays horizontal, the middle slopes up or down. - Bend Left 90 / Bend Right 90 - 90 degree angle between start and end of each rail. I haven't set any limits on the morphs, but suggest -1 to +1 for bidirectional ones, and 0 to +1 for unidirectional ones. Rules of thumb for using several morphs together - see the last two promo images. Yay ! Just the thing to rail off some weird Alien McGuffin !! A phantastic add on. Thank you very much! Oh, goody! Thank you very much! Thank you, a great addition to the original set.